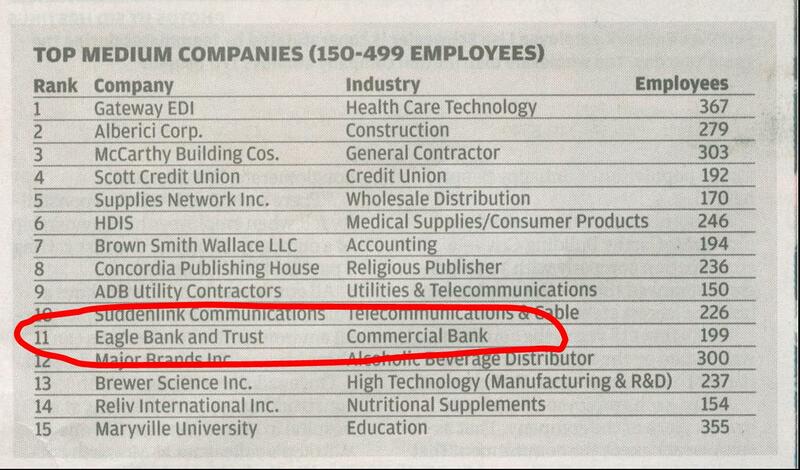 Congratulations to my friends at Eagle Bank and Trust. I want to brag about a client I’ve worked with since 2009. Eagle Bank and Trust is a regional bank in the St. Louis area that is more than 100 years old. Back when the stuff was hitting the fan in late 2008, a mutual friend introduced me to Mike Walsh, president and CEO of Eagle Bank. Mike knew that the bank, like every other bank, was facing an uncertain future. He was determined to not only weather the storm, but prosper. And boy, did he ever! Mike is a banker. He’s done some other things in his life, but he is and was always meant to be a banker. His goal when he originally retained me was to develop new levels of productivity for Eagle Bank’s retail troops, the feet on the street responsible for attracting, landing, and maintaining business relationships. To help Mike get the bank where he wanted it to be, I worked with him and the management and operations teams to establish higher levels of trust and cooperation. In all, I probably worked with more than 40 of Eagle’s approximately 200 employees. As in every group, some people jumped right in and bought into the new ideas and tools I brought in. Some kicked them like testing tires, and others rejected them. But all in all, new levels of communication developed, and they worked at learning how to use the tools I gave them. The culture evolved. With more communication between sales and operations, staffing and managing branches was streamlined. The 2009 and 2010 years were the best in the bank’s history for attracting new business accounts. The result? 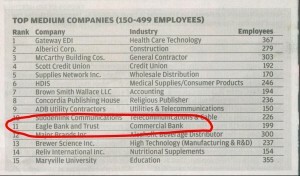 In last week’s St. Louis Post-Dispatch, Eagle Bank and Trust, which has 12 branches in the St. Louis area and a mortgage office in Clayton, was named one of St. Louis’s top 15 medium-sized work places. An interesting side note: When you look at the survey list of things employees felt were important, you can see how the different criteria of work life were ranked. Interestingly, criteria that got lumped into pay and benefits were focused on the least. Environmental and interpersonal issues ranked higher. Remembering Marcus Buckingham’s discovery in First, Break All the Rules—that people don’t leave companies, they leave managers—how would your company stack up?